Melbourne’s Swanston Street is undergoing a major upgrade to create a primarily tram and pedestrian precinct. This includes new tram stops, but the new Swanston St. stops are dangerous. The new tram stop outside of Melbourne Central is probably one of the most dangerous pieces of public architecture produced in the last several years. The design ignores basic building standards established for over 100 years and incorporates a small ‘trip’ line of around 4cm in height in the middle of what is otherwise a flat walking area. The almost invisible ‘trip line’ before the yellow paint line was added. Steps and kerbs should be a minimum of 10cm in height (preferably 15cm or 6 inches) so walkers can clearly see the change in level. The shallow trip line incorporated into this design is too low to notice but big enough to catch anyone walking normally. I have no idea how many people will need to fall and then sue the Council for negligent design before this dangerous ‘feature’ is corrected but you can guarantee there will be many accidents and near misses on a daily basis. Another view of the tripping hazard. What is tragic is the apparent inability of the designers of this tram stop to learn from similar stops created in other locations in the network or from published design principles. 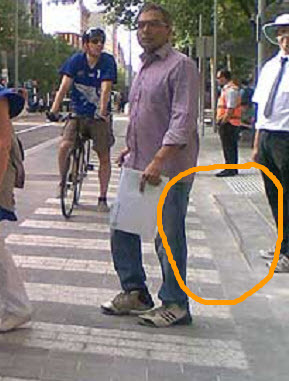 This type of ‘tripping hazard’ was a major consideration in the Bourke St. Mall design a couple of years ago and an elegant solution was developed. Even without this experience, there is plenty of information available that clearly shows it is dangerous to put a small ‘trip line’ at right angles to the direction of travel of most pedestrians. Good design suggests the ‘trip’ is either eliminated by a small change in level or protected by a hand rail. This ‘feature’ has apparently been deliberately included in the design to keep the pedestrian footpath and bike lane differentiated by having pedestrians ‘step down’ into another zone. 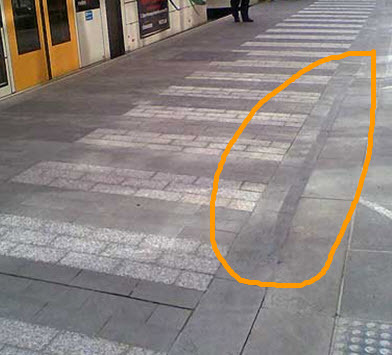 A great idea but the same separation effect could easily have been achieved by using a couple of well placed bollards or even a painted line or change in surface texture – the focus on one aspect of safety without looking at easily learned lessons on another has created a hazard that will cause serious injury to many people if it is not quickly corrected. Unfortunately a few cents of design effort to review and ‘learn’ appropriate lessons will require $thousands to fix now the stops have been built. The danger has obviously been recognised with a pretty yellow line now painted along the length of the trip line (which it totally useless if you cannot see the ground for people). My guess is nothing further will happen until the council’s insurers force the issue after receiving a barrage of insurance claims. Getting designers, bureaucrats and politicians to admit they have screwed up the design is next to impossible. But until this happens ‘enjoy your trip’ will have a completely different meaning in Swanston St.
Corporate governance is defined as aligning as nearly as possible the interests of individuals, the organisation and society. Good governance is good business! 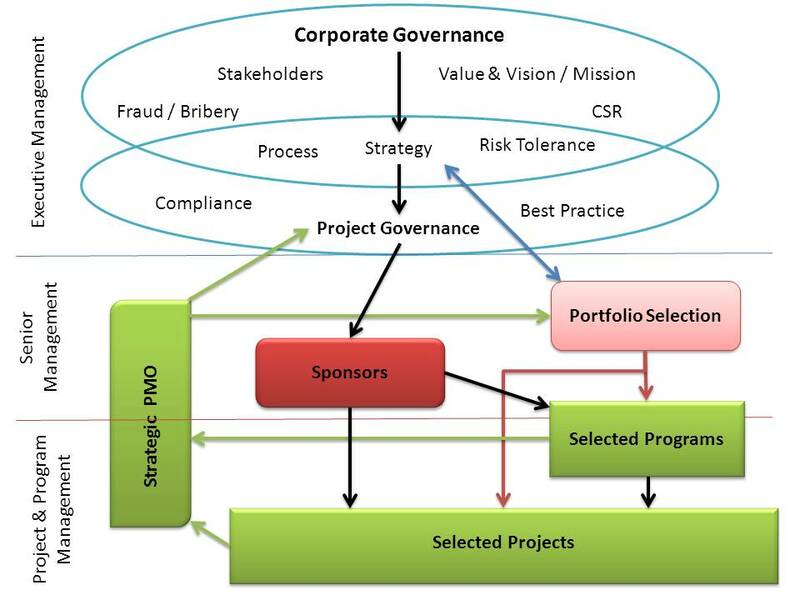 Project governance is a sub-set of corporate governance, focused on systems that ensure the right projects and programs are selected by the organisation, and the selected ‘few’ are accomplished as efficiently as possible. Projects that no longer contribute value to an organisation should be terminated in a way that conserves the maximum value and the resources reallocated through the portfolio management process to more valuable endeavours. 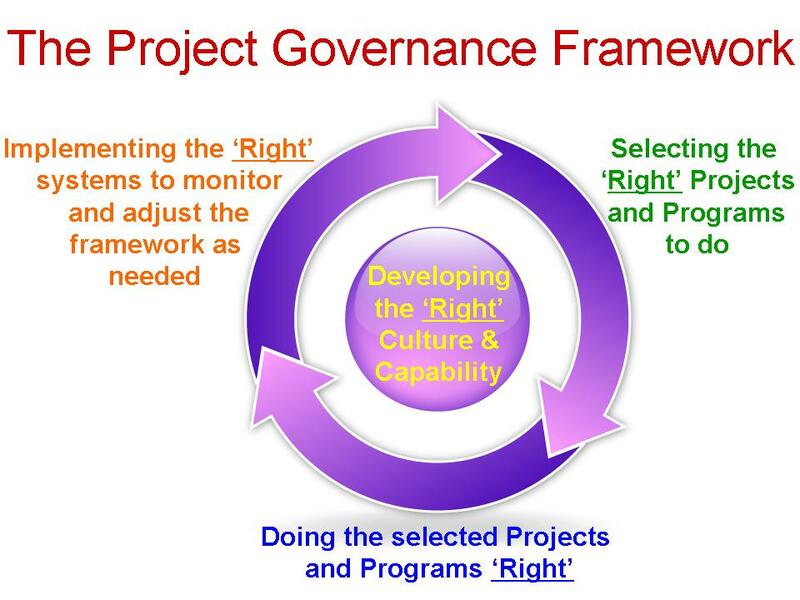 The framework for effective project governance is laid out above, and is an executive management responsibility. Sponsors and the Portfolio Selection/Management processes provide the key link between the executive and the working project and programs (for more see our Governance White Paper). The focus of this post is to look at the pre-selection activities that inform the portfolio selection processes. One of the key conclusions to be drawn from the Ombudsman’s Report discussed in my earlier post Cobb’s Paradox is alive and well was that many of the projects that contributed to the $1 billion in failures were set up to fail – the projects had absolutely no chance of delivering within the announced parameters: the inputs to the portfolio selection process were grossly flawed (or were non-existent). This appears to be a wide spread issue. Most project management standards such as ISO21500 and the PMBOK® Guide start with an approved project and a business case or similar that defines what has to be accomplished; this is the end of the portfolio selection process outlined above and is assumed to set realistic and achievable objectives. What is missing, are the steps leading up to this point; the life of a ‘project’ starts with an idea, need, opportunity, requirement or threat (the ‘concept’). The organisation assesses and studies the ‘concept’ hypothesises options and solutions and frames a proposal that becomes the foundation of a future project. These key investigative elements of a project generally sit under the portfolio umbrella developing information to allow a proper decision to be made. In mining this can represent exploration, feasibility studies, ‘bankability’ studies and concept designs which between them can cost $millions, leading to project funding. Importantly, this ‘Front End Loading’ (FEL) is seen as the key to a successful mine in most major mining corporations. Similar problems exist in major infrastructure projects, defining a solution to prison overcrowding can involve building a new major prison, building several smaller prisons, extending current prisons, changing the way criminal justice system works to reduce the need for prison places, or a combination of the foregoing options (substitute University/hospital/school, into the previous sentence to see just one dimension of the challenge). However, unlike mining, most government and many corporate organisations see effective ‘front end loading’ as unnecessary. Other organisations use the process to formulate definitive solutions to problems they have no real understanding of (typical in ICT) and then pretend the defined solution has no associated risk (because it is defined) despite the fact the full dimensions of the problem the project is supposed to solve are still unknown, and are frequently changing over time. Sometimes, the ‘investigation’ requires a significant amount of work (eg, a bankability or feasibility study); this work may be treated as a project in its own right, and is time, cost and resource constrained with a defined deliverable (the report). If the work is expected to flow forward and will only be stopped in exceptional circumstances, project phases work best, with some form of ‘gateway’ or transition review. In other circumstances, studies are undertaken as part of the portfolio by corporate or PMO professionals with no dedicated budgets, assessing multiple proposals as an ongoing process, but once a concept gets the go ahead a project is created and a budget and resources allocated. Other concepts (particularly problems) cannot be defined and an ‘agile’ approach is needed where elements of a partial solution are developed and put into use developing new learning that will then allow the next module to be developed in a progressive sequence. However, whilst this may be the most suitable and cost effective way of developing an effective solution, budgeting in a traditional ‘iron triangle’ concept of fixed cost, time and scope is impossible. The challenge is recognising which type of project is being proposed (based on Project Typology), and then deciding which type of process will develop the best input to the portfolio selection process and what level of uncertainty (risk) is associated with the proposal once developed. Certainty is not important, what matters is appreciating the extent of the risks and the likely benefits, so an informed investment decision can be made. Most ‘game changing’ initiatives involve high risk, high reward projects that create a totally new future! Gateway 1 = Business Justification, options identified and appraised, affordability, achievability and value for money established. Gateway 2 = Procurement strategy, will the proposed strategy achieve the project objectives? Gateway 3 = Investment decision, based on realistic project cost information (eg, tenders or bids) can the business case be confirmed from both the cost and the benefit perspective? Gateway 4 = Readiness for service. The completion of the project work and a reassessment/confirmation of the expected benefits as the deliverable is put into ‘service’. Gateway 5 = Benefits evaluation. Did we get what was expected now the project’s outputs are being used? Most of the risks and rewards associated with a project or program are determined long before the project manager is appointed; if these decisions are wrong (or non-existent) project and program management cannot resolve the problem. The role of effective project management is to deliver a realistic and achievable outcome efficiently; if the parameters for the project are unrealistic in the first place, the best project management can do is stop the situation deteriorating further! As far as I know, none of the various BoKs and methodologies, including the PMBOK® Guide has a ‘miracle’ process that will magically transform an impossible set of objectives into achievable set of objectives. Wishful thinking is not an effective substitute for effective project governance! 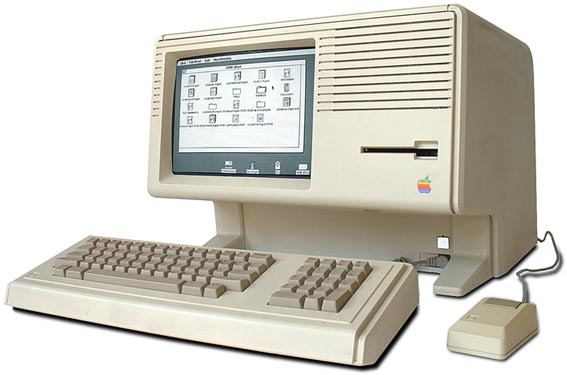 My last couple of posts on the subject of change and executive leadership generated a range of comments many suggesting if we did ‘better project management’ the problems would be resolved. Unfortunately for this to be true, the organisation still needs executive buy-in and leadership to support the process, in fact demand better project management. An article in the December edition of ‘project’, the journal of the UK Association of Project Management (APM) by Martin Samphire, a committee member on both the APM Governance SIG and the APM Portfolio Management SIG highlights more project failures. This time the FiReControl project which was described by the House of Commons Public Accounts Committee as ‘one of the worst cases of project failure the committee has seen’, followed by a catalogue of fundamental failures; and the NHS Connecting for Health program which is beset by weak program management. The UK industry and Government know how to deliver large complex programs, the work of the Olympic Development Authority is a world class example; it’s just that many other managements simply choose to ignore good practice, or more accurately refuse to change to allow good practice to be introduced. The changing of a system of management is a very serious matter and cannot be done by a superintendent in his spare time (Work Wages & Profits, p168). In every workroom there is a fashion, a habit of work, and every new worker follows that fashion, for it isn’t respectable not to (Work Wages & Profits, p186). The most casual investigation into the reasons why so many of the munition manufacturers have not made good, reveals the fact that their failure is due to lack of managerial ability rather than to any other cause (Organizing for Work, p64). Our most serious trouble is incompetency in high places. As long as that remains uncorrected, no amount of efficiency in the workmen will avail very much (Organizing for Work, p64). Our industries are suffering from lack of competent managers,—which is another way of saying that many of those who control our industries hold their positions, not through their ability to accomplish results, but for some other reason (Organizing for Work, p64). Martin Samphire’s view is that applying good governance in their management is 80% of the answer to successful projects. I feel he is understating the importance of the role and responsibility of the senior executives, particularly when it comes to the process of changing an organisations culture to accept good governance and effective project management!